The third night here in Berlin was another very hard evening of racing. Glen Rendall and Alex Cloutier toughed out the racing, and demonstrated that they are not only improving technically, but also riding themselves into form. More accurately, the race is coming to them: because it is very difficult for a rider without access to a track to maintain the type of leg speed so important in this type of racing, Glen and Alex came to Zurich with more speed endurance from their interval training than pure speed. Many of the riders here are in the opposite situation, and the speed is quickly burning out of their legs. As the race goes on, Glen and Alex will be in a better position to exploit the fitness they do have. To add to that, concentrating on technical improvement is already showing a benefit as they are able to save more and more energy during the races. These improvements bring with them better results, obviously, but also increased confidence and morale, which helps even more. The first event of the night was a 25 km madison. The race seemed more nervous than the two previous days, perhaps because fatigue is building up so riders are taking more chances. The pace was still very fast despite this, and the half-way point a small group had lapped the field. Glen and Alex missed this move, but had worked themselves up toward the front, which allowed Glen to win one of the intermediate points sprints. 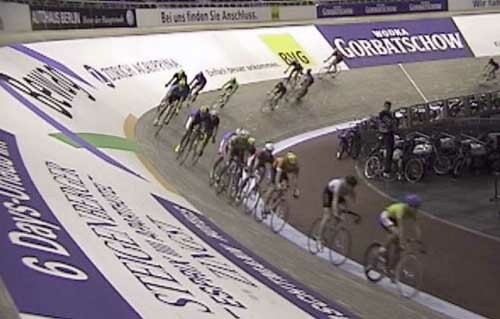 Positioning in a madison pack is key to being able to contest the sprints, and for that sprint it clicked perfectly. Glen also launched a well-timed attack at the end of the race, as another group attempted to lap the field. Had the group caught the pack, Glen would have thus won the final sprint. The group was able to hold itself back, however, so they took the points instead of Glen. 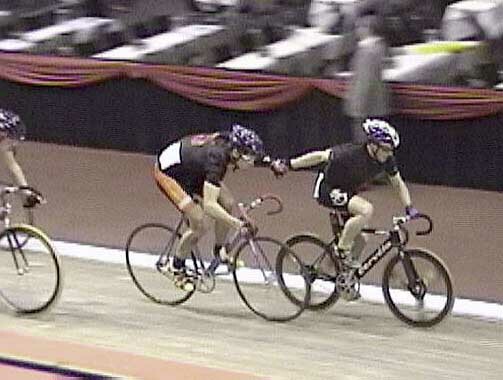 The second race was a 50-minute madison. The stadium was filling up with spectators so the air gradually filled with the smells of beer, bratwurst, cigarette smoke and the cacophony of thousands of Germans cheering and blowing on whistles (handed out at the entrances). The French pair of Genauzo and Tejada, who won the Zurich six in December, took a lap on their own in impressive style, sealing the stage win for themselves. They confided in me before the start that they had only just found out that the overall classification was decided on a points system, not laps. We had noticed that they had been mysteriously conservative in the racing so far. Mystery solved. The pack split and reformed numerous times during this race, which the announcer claimed averaged 55 km/h. Whether or not that was true, it was damn fast and it was all the more impressive when Glen launched off the front with four laps to go and got a solid gap before handing off to Alex, who held off a late challenge to win the final sprint and score double points. The result put them in 6th on the stage, a good morale boost if ever there was one. Tomorrow is a morning program: the racing starts at 9:00, which means getting up before six . . . Good night. Glen hands off to Alex. Visser laisse sa marque à St.Paul! St.Paul, Minnesota (DIAPO) - Guido Visser a trouvé une nouvelle façon de faire parler de lui. Après son large sourire malgré une dernière place aux Jeux olympiques de Nagano, le fondeur de St-Ferréol-les-neiges a fait dans la fantaisie au 10 kilomètres style classique de la Coupe continentale de St.Paul. Une spectaculaire chute lui a valu le 20e rang au total et le 8e rang parmi les Canadiens présents, dont Robin McKeever, gagnant de l'épreuve.
" Je suis vraiment bien parti, a expliqué l'inimitable Visser. Après deux kilomètres, je n'avais que cinq secondes de retard sur Robin. Mais au bas d'une pente glacée, j'ai complètement perdu le contrôle ! Je me suis envolé. J'ai fait une sorte de mouvement de skateboard avant de chuter ", de dire Visser, toujours aussi précis dans ses récits. Malgré tout, Visser a complété les 10 kilomètres en 30:14 minutes alors que McKeever l'a fait en 28 :29 min. " J'ai fait une bonne course quand même. Je ne suis qu'à 30 secondes du quatrième Canadien ", de poursuivre Visser, qui doit absolument obtenir un top 4 canadien pour avoir droit de participer à une Coupe du monde en Europe. " Je suis confiant pour demain (le 15 km de dimanche). Il me faut juste éviter le freeskiing ! "